Planted together, grass and legume species provide more balanced livestock forage than either does alone, say assistant professor James Rogers of the Samuel Roberts Noble Foundation. Adding legumes to grass seed restores soil nitrogen levels, improves livestock health and benefits wildlife that feed on forage. Finding compatible grass and legume species is the key to a successful forage mix. Cool season grasses and legumes provide late fall and spring forage, according to the University of Georgia Cooperative Extension. Highly nutritious when mature, annual ryegrass (Lolium multiflorum) has a 10 to 16 percent crude protein (CP) content. It’s also highly digestible, with livestock metabolizing 70 percent of its matter as energy (TDN). Ryegrass extracts significant amounts of soil nitrogen. Mixtures with ryegrass frequently contain annual crimson clover (Trifoluim incarnatum), a cool season legume that replaces nitrogen. Some cultivars of this short-lived early bloomer die before competing warm season grasses sprout. A deep-rooted grass, cool season perennial tall fescue (Lolium arundinaceum) provides forage in autumn, late winter and spring. Its most abundant production--better than 50 percent of its annual total--occurs in spring, states the UG Cooperative Extension. This moisture-loving grass pairs well with white clover (Trifolium repens), one of the most widely planted cool season perennial legumes. White clover also provides fall, late winter and spring forage. It needs consistently moist soil. Native to Africa, pearl millet (Pennisetum americanum) is a tall, upright multistemmed grass suitable for grazing, silage or hay. Some varieties of this warm season annual grass provide 6 tons of forage per acre, states the UG Extension. Grass harvested before full maturity has a TDN between 52 and 58 percent, with CP measuring 8 to 11 percent. Grass seed in April is suitable for grazing between June and August. Grown more often for silage and hay than for forage, forage soybeans (Glycine max) provide short-term late summer grazing. Planting this warm season legume at a rate of 90 to 120 lbs. of seed per acre results in decreased stem size and increased digestibility, with a TDN approaching 60 percent. Highest yields come from planting late-maturing varieties between May and early June, according to the UG Cooperative Extension. Tough and rapidly spreading, Bermudagrass (Cynodon dactylon) is a deeply-rooted plant that thrives in well-drained, moist fertile soil. Some hybrid Bermudagrasses yield 4 to 6 tons of hay per acre under optimum conditions. This grass is most nutritious grazed to 2 to 6 inches, notes the UG Extension. Spreading by seeds, roots and stolons--horizontal, aboveground shoots--Bermudagrass often takes over pastures where other grasses have declined. Perennial peanut (Arachis glabrata) is a nutritious, warm season legume suitable for southern pastures. 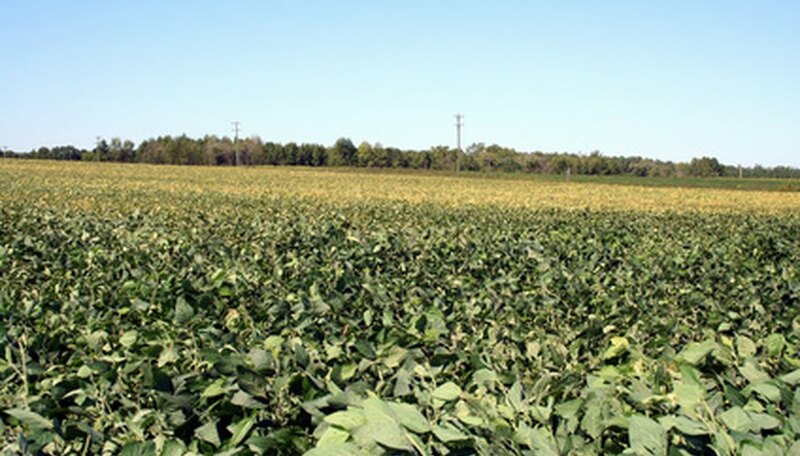 Planted from December to early March, it may take more than two years to reach a harvestable state, according to the UG Cooperative Extension. Because it doesn't hold up under grazing, perennial peanut is usually grown for hay and silage.